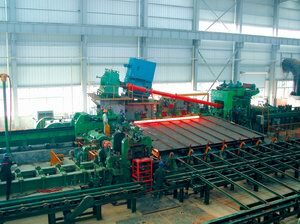 After dozens of installations of Piercing Mills, Rotary Expanders, Sizing Mills / Stretch Reducing Mills, Pipe Straightening Machines, Hot Pilger, Accu and Assel, China has emerged as a more and more important supplier for 2-roll retained mandrel mills (MPM) and 3-roll retained mandrel pipe mills. We have delivered 2 MPM in China, and another one for India is under manufacturing. 3-roll retained mandrel mill completely designed by us is under manufacturing as well. 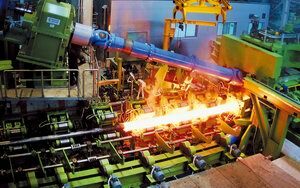 Shandong Molong Petroleum Machinery Ltd.
Xining Special Steel Co., Ltd.
Hubei Daye Special Steel Plant Co., Ltd.
Wuxi Seamless Steel Tube Corporation Ltd.
Tianjin Steel Pipe Manufacturing Co., Ltd.
Panshi Seamless Pipe Manufacturing Co.,. Shanghai Hailong Steel Pipe Co., Ltd.
Jiangsu Changbao Steel Pipe Co., Ltd.
Wuxi Seamless Steel Tube Corp. Ltd.
Panshi Seamless Pipe Manufacturing Ltd.
We are also in a position to supply auxiliary machines and equipment such as sizing mill / SRM roll profiling machine, mandrel, heavy duty lathe for MPM roll groove dressing, high pressure descaler, hollow de-oxidation device, etc. Copyright © 2009 Phamitech.com All Rights Reserved.